After you've run a spreadsheet comparison in Microsoft Spreadsheet Compare, you can quickly see the underlying formulas for cells shown in the comparison grid. Do this by choosing the Show Formulas button. 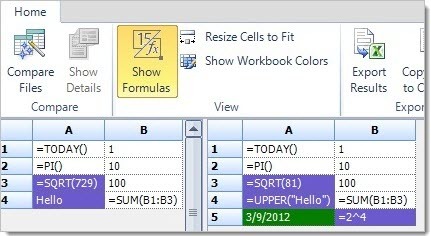 Here, the formulas are shown in their cells, instead of the results of the formulas. 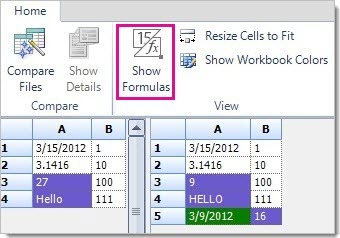 In the image above, cell A1 shows the date, 3/15/2012, but in the image below, the formula =TODAY() is shown. This can make it easier to compare formulas side-by-side from different workbooks to find subtle changes. Choose Show Formulas again to switch back to showing the results of the formulas.